1. 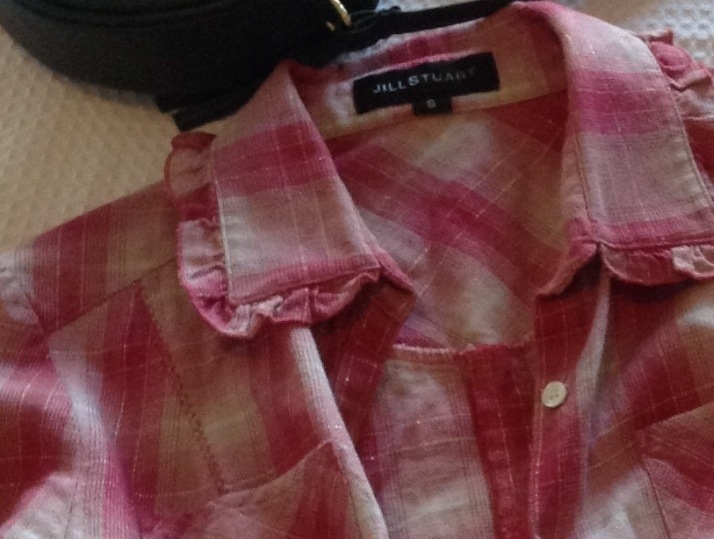 Jill Stuart Vintage Tartan Shirt with Gold Thread. I call this Vintage because I’ve had it forever. I purchased it New at a sample Sale in Melbourne many many years ago. I’m glad I kept this one (I’m kind of a hoarder when it comes to my wardrobe, you will notice this as I start to pull things out and show you). And I’m 30 “something” so I have things from the nineties that still fit and are cool + I’ve kept things from my mum over the years. 2. ASOS Bunny Rabbit Cross Body Bag. 3. Siwy Crop Ankle Hannah Jeans from shopbop. 4. Silver Wedge Runners (random shop on Chapel Street, South Yarra). PS: Shoes on the bed…my mum wouldn’t like..an old wives tale, said to bring you bad luck.